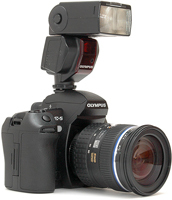 The Olympus E-5 is a new, rugged digital SLR camera that is the new flagship of the Four Thirds system. Inheriting the tough magnesium alloy body, environmental seals, large and bright viewfinder, ultra-fast multi-point AF system, 1/8000th second top shutter speed, body-integral image stabiliser, sensor dust buster and Live View capability of the three-year-old Olympus E-3; the E-5 gains two million extra pixels, a larger and much higher-resolution articulated LCD screen, a newer image processor, a range of Art Filters, a dual-axis electronic level gauge, a new "horizontal only" IS mode, AF fine tuning and HD video recording with manual exposure control. Also new is the top sensitivity of ISO 6400 and an HDMI port, as well as some minor feature enhancements such as face detection in Live View, a new "i-Enhance" picture mode, and the option to choose from a variety of aspect ratios. Along with the E-5, Olympus also introduced a new, 1600mAh battery called the BLM-5, but the camera remains compatible with the older, 1500mAh BLM-1 too. 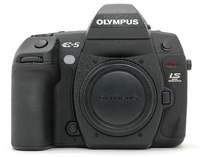 The Olympus E-5 camera body is available for £1499 / $1699 in the UK and the USA, respectively. The body itself is nearly identical to that of the E-3. A prominent and well-sculpted right-hand grip ensures a firm hold, while a thoughtfully positioned and rubberised thumb rest adds further comfort. The viewfinder is just as excellent as it was on the E-3. During the review period, I shot the Olympus E-5 alongside a Nikon D3X that was used for an upcoming lens test; and while the finder of the full-frame camera was obviously bigger, I was surprised to find I didn't actually notice this without paying attention to the difference on a conscious level - this is saying a lot about how good the Olympus' finder really is. The eleven autofocus points are permanently marked on the focusing screen but are not too obtrusive and do not divert your attention from the subject. 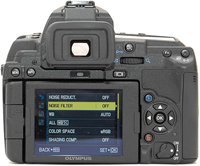 The in-finder LCD runs along the bottom, similarly to the E-1, E-3 and E-30, but unlike most other Olympus DSLRs. A green dot lights up whenever the camera thinks the subject is in focus - this function can also be used to check focus when focusing manually, but alas, it only works with dedicated Four Thirds lenses. When using a legacy lens with an adapter such as Olympus' own MF-1 unit, the above described electronic focus confirmation is unavailable. The shutter release is well placed, falling readily under your right index finger, and the ISO, WB and exposure compensation buttons are all within easy reach. They are also differently shaped so you can tell them apart by touch, without having to take your eye off the viewfinder. The camera features two control wheels for quick adjustment of settings, with the rear one being perfectly placed for your right thumb, and the other being easily accessible to both your index and middle fingers. The overall "philosophy" behind the E-5's user interface is the same as the E-3 - either push a button and turn a dial, or call up the interactive "Super Control Panel" to change a setting. Simple, quick and intuitive - but there are a few drawbacks. As with the E-3, the Olympus E-5 has a few buttons that serve multiple purposes depending on which dial you use them in tandem with. To wit, there are three buttons left of the pentaprism (when viewed from above and behind) that do different things when used in conjunction with the front or rear control wheel. The foremost of these buttons controls either the flash mode or flash exposure compensation, the second sets the exposure mode (P, A, S, M or Bulb) or the drive mode, while the third controls the focusing mode or the metering (this one even has a third function in Playback mode). Worse still, bracketing can be set by holding down the second and the third button simultaneously, and turning a dial. Current E-3 owners trading up will be familiar with these oddities but new owners are likely to go through at least a few days of frustration. For example on the first day of the review period, I wanted to change the focus mode and ended up with the meter set to highlight-based spot metering instead. One of the reasons is that while the primary function of each button is marked on the button itself, the secondary function is denoted with icons on the prism housing, and these are hard to see from above. The changes you make can be monitored on the top and rear displays as well as the in-finder status bar, so this is not such a big deal as it may seem at first, but you do have to pay close attention to what you are doing until it becomes second nature. The "Super Control Panel" mentioned above is an interactive status screen displayed on the rear LCD monitor. Push the OK button to call it up, move around the screen using the arrow buttons, and use the OK button again to effect changes to settings. This solution allows you to quickly access a number of functions, including many that have no direct-access buttons, without having to enter the convoluted and not entirely logical menu system. Speaking of the screen, it is among the Olympus E-5's true highlights. Like the one on the E-3, it is fully articulated, but has grown in size and offers a much higher resolution. This is a truly gorgeous and highly versatile screen, comparable only to that found on the Canon EOS 60D (which is even higher specified). A vari-angle LCD panel like this may seem too fragile for a tough professional body, but it is actually quite robust and an even be folded inward when not in use, for additional protection. The increased size of the screen has necessitated a reshuffling of the rear controls, which is why the biggest differences versus the E-3 can be spotted on the back panel. The physical IS button is gone, and the image stabiliser settings can only be set on the Super Control Panel. This alone wouldn't be a huge problem, but the lack of an IS button also means you can no longer preview the effect of the image stabiliser in Live View (on some Olympus bodies, you can do this by holding down the IS button). The memory card door lock has also been scrapped, and the door now slides open the same way it does on some cheaper bodies. The row of buttons that ran along the bottom of the screen of the E-3 is no longer there. Two of these buttons, labelled MENU and INFO, have been moved to the top left. I have to say that this is an unfortunate location for the INFO button, as you have to tilt and angle the camera to reach it, which interrupts the shooting experience. The Live View button has found a much better new home left of the thumb rest, while the Delete button has moved closer to the four-way pad. The power switch, which was apparently modelled after that of some older Canon DSLRs, is close to its original position near the bottom of the back panel. 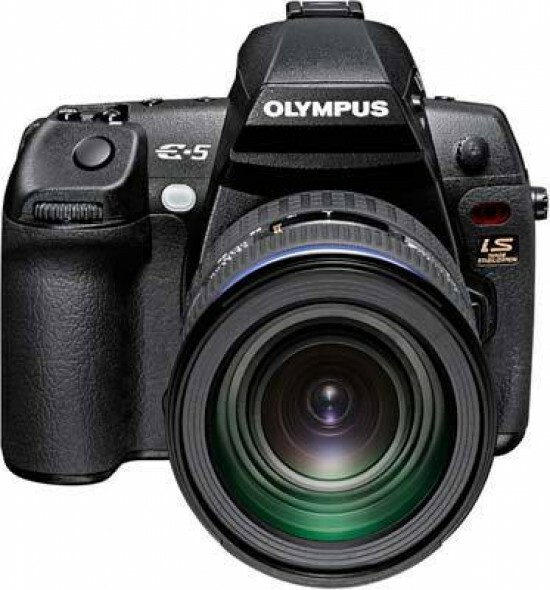 Using the Olympus E-5 as a traditional SLR is a thoroughly enjoyable experience. The camera is quick and responsive, with only the start-up time being a little, though not much, longer than expected at this level. Autofocus is blazing fast with the 12-60mm lens - certainly among the fastest in the world, at least in moderate to good light. In low light, it becomes noticeably slower but remains operational down to very low light levels. Unlike most other AF systems, the one employed by Olympus uses only cross-type, biaxial focus sensors, meaning every AF sensor is equally sensitive to both horizontal and vertical detail. You can use the arrow buttons to quickly change the active AF point. The camera does not feature a dedicated AF assist light - the flash can be used for this purpose, but it's quite annoying for the subject, and not that necessary given how sensitive the focus sensors are. Movie recording is a complete novelty on an Olympus E-system DSLR. 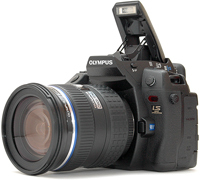 The company has already implemented video in its PEN series of Micro Four Thirds cameras, but the Olympus E-5 is the first Four Thirds model to offer this feature. There is no dedicated video shooting mode, as you can start recording a clip at any time while you are in Live View. Good news first: the camera allows the user to set exposure (shutter speed and aperture) and gain (ISO) manually in M mode (aperture only in A mode). Recording starts when you push the button in the top right corner of the back panel. Push this button a second time to end the recording. There is no continuous, full-time autofocus, but you can engage AF at any time via a half-press of the shutter release - just remember it won't be terribly quick, and the microphone might pick up the sound of the focus motor. It's also possible to take a still photo while recording a clip, by fully pressing the shutter release, but doing so interrupts the video recording for several seconds. And now for the bad news: while you can shoot 720p HD movies, you don't get Full HD resolution, and you cannot change the frame rate, which is fixed at 30fps. Clip length is limited to 7 minutes (HD) or 14 minutes (VGA) - fine if you are shooting a scripted film but not when you want to capture a school play, football match or an extended ceremony. And while the footage captured is generally clean and sharp, the typical "rolling shutter" effects will raise their ugly heads when doing quick pans or capturing rapid movement. It is possible to record audio via the built-in mono microphone or optional stereo inputs. Video clips are recorded in Motion JPEG format and stored in an AVI container. The Olympus E-5 offers a range of Art Filters that can be applied to videos at the capture stage, potentially alleviating the need to buy specialised software to add creative effects. 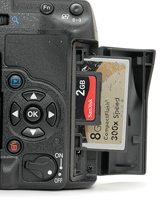 The camera can save movies and photos on Compact Flash and SD memory cards. The fact that the company has retained compatibility with CF cards, and added support for SD while dropping its own outdated xD-Picture card format is welcome. Sadly, it still failed to properly implement the dual card concept. While you can have one of both cards inserted at the same time, you have to specify which one should be used by the camera. This means the Olympus E-5 cannot create instant back-ups of your files by recording them on both memory cards simultaneously, neither can it switch from one card to the other automatically when the first one fills up. This is a major disappointment, as we expected the new Olympus flagship to be capable of these simple tasks. The Olympus E-5 is powered by a new BLM-5 battery but is fully compatible with the older BLM-1 packs as well (so much so that Olympus actually supplied a BLM-1 rather than a BLM-5 along with our review unit). The battery compartment is pretty far from the tripod socket, so it may be possible to change batteries while the camera is on a tripod, depending on the size of the quick-release plate you are using.